Vidal Brujan capped the Stone Crabs' sixth inning rally with an RBI single Saturday. 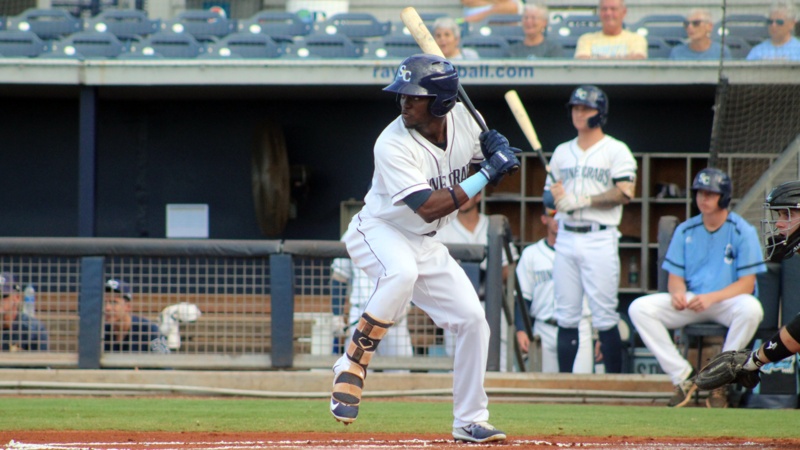 PORT CHARLOTTE, Fla. (April 6, 2019) - All nine starters recorded base hits Saturday as the Charlotte Stone Crabs scored in four consecutive innings to take down the Fort Myers Miracle 7-4 at Charlotte Sports Park. The Stone Crabs (1-2) set a season high with 12 hits and earned their first win of the season in their home opener. Charlotte starter Resly Linares labored through three innings but allowed only one run and one hit while walking four. With the Stone Crabs trailing 1-0 in the bottom of the fourth, Tyler Frank doubled down the left field line before Zach Rutherford walked. With two outs, Russ Olive smacked a two-run double to the wall in right center to give Charlotte a 2-1 lead. Still leading by that margin in the bottom of the fifth, Moises Gomez singled before Carl Chester drew a walk. The next batter was Ronaldo Hernandez , who shot a single to right to score Gomez and make it 3-1. Miracle starter Tyler Watson (0-1) then issued a wild pitch, allowing Chester to come in and make it 4-1. With the Stone Crabs up three in the sixth, Rutherford led off with a single. Two batters later, Tanner Dodson roped a double to the left field corner to put runners at second and third. Zac Law then plated Rutherford with a groundout before Vidal Brujan drove in Dodson with an infield single to cap the inning with a 6-1 lead. The Miracle (2-1) drew the game closer in the top of the seventh when Aaron Whitefield clobbered a two-run home run to left. But Charlotte tacked on another run with a Frank sacrifice fly in the seventh to make it 7-3. Fort Myers threatened to close the gap in the eighth, loading the bases with one out. However, Charlotte reliever Chandler Raiden pitched out of trouble, allowing only one run of damage. Raiden worked a scoreless ninth to earn the save. The Stone Crabs will look to earn a series split on Sunday at 12:30 p.m. Tobias Myers makes his High-A debut for Charlotte against Baily Ober of the Miracle. Coverage begins at 12:15 p.m. on the Stone Crabs Baseball Network.